Clinical audit is essentially a quality improvement process. It has been described as a technique to “assess, evaluate, and improve the care of patients in a systematic way to enhance their health and quality of life”1. Audit was believed to have begun with Florence Nightingale in 1854. It has undergone considerable development since that time to become Clinical Audit as it is known today. Provide useful evidence of continuing professional development activity. What is the difference between audit and research? Research and audit are often confused; some of the differences between audit and research are explained in the table below. May involve experiments based on a hypothesis. Never involves experiments and involves measuring against pre-existing standards. It may involve random allocation. It never involves random allocation. There may be extra disturbance to patients. There is little disturbance to patients. It could be a new treatment. It never involves a completely new treatment. May involve experiments on patients. Patients continue to experience their normal treatment management. It is usually a lengthy process and involves large numbers of patients. It is usually carried out involving a small number of patients and within a short time span. It is based on a scientifically valid sample size (except in the case of some pilot studies). It is more likely to be conducted on a pragmatically based sample size. Extensive statistical analysis of data is routine. Data analysis can take a number of forms depending on whether qualitative or quantitative research has been carried out. Some statistics may be useful. Results can be generalisable and hence publishable. Quantitative research tends to be more easily generalisable than qualitative work. Results are only relevant within local practice settings (although the audit process may be of interest to a wider audience and hence audits are publishable). Responsibility to act on findings is unclear. Responsibility to act on findings rests with individual osteopaths. Findings influence the activities of clinical practice as a whole. Findings influence activities of practitioners within a practice. Always requires ethical approval. Does not require ethical approval. Research can identify areas for audit. Audit can be a precursor to clinical research by pinpointing where research evidence is lacking. What is the audit cycle? 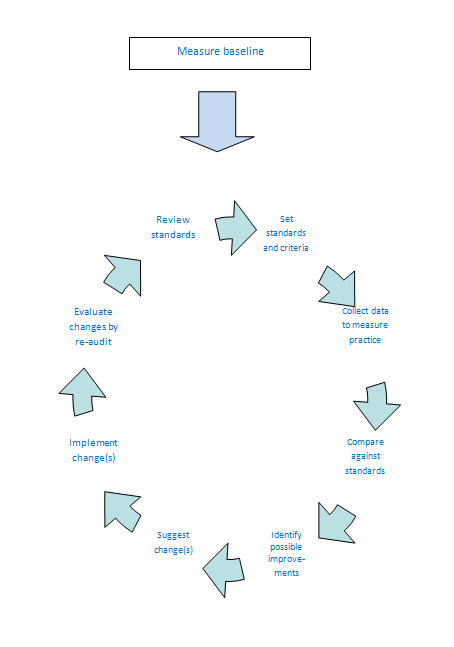 The audit cycle is the process that is undertaken when conducting an audit in clinical practice. Unfortunately, all too often the last stage of the process is forgotten and the audit remains incomplete. Initial baseline data is gathered on a specific area of practice. The current standard in this area of practice can be identified and new standards can then be set. Changes can be identified and implemented to try and affect practice; the effect of those changes can be evaluated and standards can be reviewed. What types of activities can be audited? Structure: The manner in which resources and personnel are organised and available within a practice. Process: This includes activities undertaken within a practice including those of support staff, and clinicians as they deliver patient care. Outcome: The effect of the osteopathic management on the wellbeing of patients consulting for treatment; this includes active care, education, and advice for patient self-management. An audit handbook specifically intended for osteopaths in private practice has been developed by NCOR. The handbook is available to all osteopaths as a PDF to download, and via the General Osteopathic Council CPD website. A range of audit tools have been developed suitable for practice. They can be found here. Where can I find other sources of information about audit? 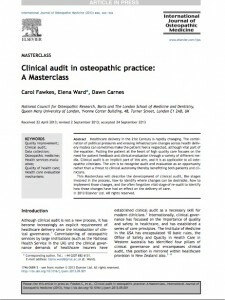 NCOR have written a Masterclass entitled “Clinical audit in osteopathic practice”. Click on the paper below to read the full article. A range of publications exist concerning clinical audit; they vary considerably in terms of detail. A summary of what audit is and isn’t can be found in the summary prepared by the Royal College of Psychiatrists and can be found here. (www.rcpsych.ac.uk/pdf/clinauditChap1.pdf). A general guide to audit, and advice on further sources of training can be found at the Clinical Audit Support Centre. An in-depth guide can be found in the document entitled “Best Practice for Clinical Audit” and can be found here. Clinical audit is an inherent part of NHS practice. A number of extremely useful guides on all aspects of the process aimed at NHS staff can be found here. 1. Irvine D and Irvine S (eds). (1991). Making Sense of Audit. Radcliffe Medical Press, Oxford. 2. Mawson SJ, and McCreadie, MJ. TELER: the way forward in clinical audit. Physiotherapy. 1993;79(11):758–761. 3. Donabedian A. (1980). The definition of quality: a conceptual exploration. In Explorations in Quality Assessment and Monitoring. Ed. Donabedian A. Ann Arbor, Michigan: Health Administration Press.